Urging active-duty soldiers to be guided by a higher “moral or ethical standard” than the one demonstrated by their commander-in-chief, two war resisters who previously served as U.S. Army Rangers called on members of the military to refuse President Donald Trump’s orders to report to the U.S.-Mexico border. In an open letter published by Common Dreams Thursday, Rory Fanning and Spenser Rapone asked soldiers to examine the context in which about 4,000 migrants are currently traveling to the U.S.—and ask themselves whether 15,000 armed soldiers should be confronting families who are expected to arrive at the border at the end of November after weeks of traveling to escape poverty, violence, and unrest. 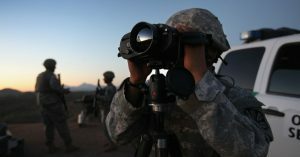 Rapone and Fanning are far from alone in their objection to Trump’s plans to send up to 15,000 soldiers to the border to provide so-called “defense” against the migrants who are hoping to seek asylum in the U.S.
A number of veterans and former government officials have also slammed the president’s proposal, noting that the military has already been “strained by 17 years of war” while 5,200 soldiers—the same number of troops still stationed in Iraq—are already at the border. “Service members who have repeatedly spent long periods of time away from home don’t need this. And the U.S. doesn’t need its military to ‘defend’ against a group of unarmed migrants, including many women and kids,” wrote David Lapan, a former Marine who worked in the Department of Homeland Security under Trump. “This is a craven political stunt by President Trump ahead of the U.S. midterms, and a cynical capitulation by a secretary of defense who has prided himself on improving the readiness, focus, and lethality of the U.S. armed forces,” Kelly Magsamen, a National Security Council official who worked in the George W. Bush and Barack Obama administrations, wrote in Defense One. Plans to deploy troops to the border are part of Trump’s response to a “caravan” of migrants who have been traveling since October 12, beginning in Honduras and gathering more members as they head towards northern Mexico in hopes of seeking asylum in the United States. The president’s attempts to portray the migrants as dangerous as Americans vote in the midterm elections have been rejected by progressives and journalists. Fanning and Rapone also urged soldiers to reflect on the fact that U.S. actions and policies have contributed to Central Americans’ desperation to leave their home countries in recent months. “Look no further than Honduras, where the Obama administration supported the overthrow of a democratically elected president who was then replaced by a repressive dictator,” wrote the veterans, referring to the 2009 coup which ousted Manuel Zelaya. Following the coup, Secretary of State Hillary Clinton supported an election that legitimized the new government, which has overseen widespread corruption while cracking down on dissent in the country. While wreaking havoc in numerous countries, the U.S. has maintained its status as a stable democracy and one of the wealthiest countries on the planet, where people from around the world understandably hope to be able to benefit from its vast resources after seeking asylum. Fanning and Rapone urged soldiers to disavow the president’s racist attempts to portray migrants as dangerous in order to galvanize his base ahead of the elections, and work together to show Trump that they will not participate in criminalizing and endangering the lives of asylum-seekers.